2016 Oset MX-10. Picture credits - Oset. Submit more pictures. 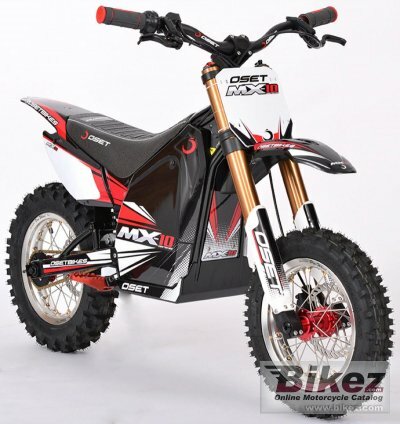 The OSET MX-10 is designed as the first bike for off-road, motocross and play riders. Compared to the traditional petrol �first bikes� sold for the last few decades, this machine is a leap forward in performance and usability. Wheels: Alloy rims/hubs, wire spoked. 10� MX tyres. Seat height: 495 mm (19.5 inches) If adjustable, lowest setting. Alternate seat height: 550 mm (21.7 inches) If adjustable, highest setting. Comments: 4 x 10ah AGM SLA batteries. Intended for children 4-7 years. Ask questions Join the 16 Oset MX-10 discussion group or the general Oset discussion group. Bikez has reestablished Bikez.info motorcycle web shop overview. Here we present the major online shopping possibilities for motorcycle parts, gear and accessories. This includes customizing and insurance. Search and compare products and prices. Try our 2016 Oset MX-10 discussion forum if you have questions or comments. Information about any technical issue is always welcome.